Now i am confused. 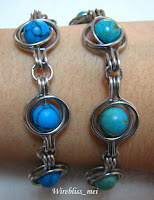 Stones for both bracelets are turquoise - that's what i was told by the vendor when i bought them. But they are of different colours....which one is real and which one is plastic? Nevertheless, the dark blue one turned out quite nice. This piece is commissioned by a friend for her mother in-law, mother's day present. Hi, I love your work and your pieces have given me a lot of inspiration, allthough my wirewrapping is nowhere as neat as yours. The Turquoise may be chalk Turquoise, powdered Turquoise mixed with resin and most of the time a dye. Turquoise is allmost allways tampered with, simply because in it's natural form it is to soft to use. It is allso possible that it is dyed Howlite, unfortunately some vendors sell it as genuine Turquoise. Keep up the beautifull work! !